Vicura MC-2844 (1-o-tolylbiguanide) is an off-white powder which has C9H13N5 as chemical formula. 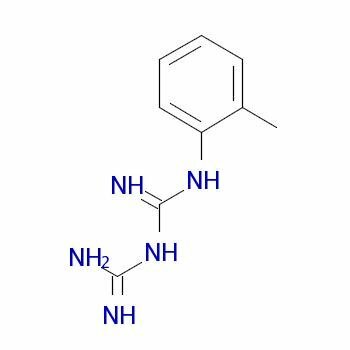 This substance finds its application in powder coatings and is also known as substituted dicyandiamide or modified dicyandiamide. nter content here. Europe: Vicura MC-2844 is on stock in our local warehouses. Our leadtime is about one week if delivered in 25 KG carton boxes. The higher solubility in epoxy resins compared to substituted dicyandiamide provides high- gloss clear coatings with high transparency and very good mechanical properties. In a high-gloss epoxy system Vicura MC-2844 (1-o-tolylbiguanide) gives good flow properties with best corrosion resistance at low curing temperatures. Realize hardening of 150 ͦC min or 180 ͦC min. Used for epoxy powder coatings. Available packaging: 25 KG fiber drums. Store 1-o-tolylbiguanide in a cool, dry and well-ventilated area and in line with legal requirements. A Material Safety Data Sheets (MSDS) is available for Vicura MC-2844 and all other products supplied by Vesta Intracon BV. This substance (CAS: 54553-90-1) has been registered under REACH (EC) 1907/2006. 1-o-tolylbiguanide | CAS:93-69-6 | Disclaimer. This information is supplied solely for informational purposes and Vesta Chemicals bv makes no guarantees or warranties, either expressed or implied, with respect to the accuracy and use of this data. All product warranties and guarantees shall be governed by the Standard Terms of Sale. Nothing in this document is legal advice or is a substitute for competent legal advice.